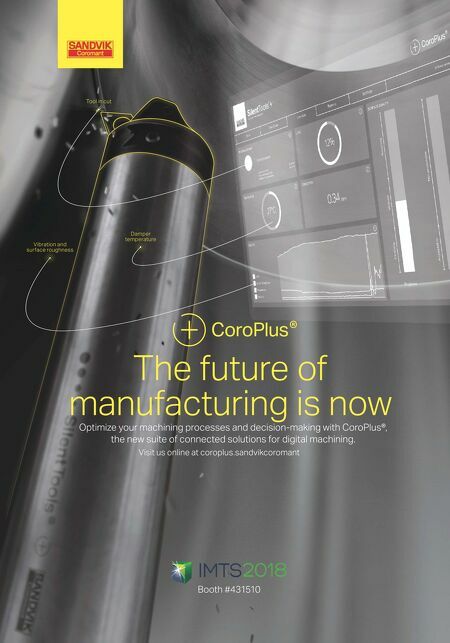 COMPETING IDEAS MMS JULY 2018 30 mmsonline.com Manufacturing Management Increasing the Effectiveness of Your Training Few would argue with the importance of having a skilled workforce. In some cases, new hires bring the skills needed to be "up and running" quickly. However, it is more common that a certain amount of training is required to equip employees with the necessary skills to be successful. Often, plan- ning and scheduling this training can present a dilemma for employers. Here are some thoughts on what you can do to make your training efforts work best for you. • Be sure the training is clearly defined with a specific outcome. Training that cannot be tied to a desired outcome is unlikely to have much impact. You need to define the intended out- come as simply as possible. For on-the-job skills training, a desired outcome could be to enable the trainee to load parts into a CNC lathe, start the machine cycle, unload parts and check critical part dimensions. For training on an administrative process, the outcome could be to accurately enter customer orders into the enterprise resource planning (ERP) system. For soft-skills training, the outcome might be to use the Five-Why technique to help solve recurring problems in the employee's depart- ment. It is essential that the desired outcome be defined before training begins. • Identify the best participants for the training. Some believe in training everyone on everything. This shotgun approach may make us feel good as it provides equal opportunity for everyone to learn new skills. Unfortunately, with limited resources, it may not be practical to train everyone on everything. Prioritizing the training needed and identifying those who will benefit most will yield the best outcome. There is always the option of training more employees at a later time, but initial training efforts need to be directed to those who will learn and apply what they have learned in the shortest time. • Be comfortable with the trainer(s). In addition to a trainer knowing the subject matter, there is a great benefit to a trainer being familiar with the company and those who will be trained. This is usually easier to accomplish if an internal training resource is used. However, an expe- rienced external resource can be effective if he or she takes the time to learn something about the company and its employees. Understanding any unique aspects of the com- pany, or employee strengths and limitations, can help a trainer tailor a program for success. If an employee is selected to conduct on-the-job skills training, this person must have both knowledge about the subject and the ability to communicate this information effectively. The most experienced and high- est-skilled employees do not automatically make good trainers. 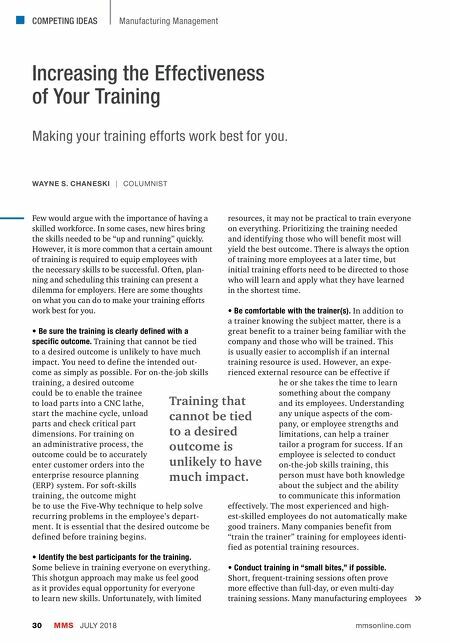 Many companies benefit from "train the trainer" training for employees identi- fied as potential training resources. • Conduct training in "small bites," if possible. Short, frequent-training sessions often prove more effective than full-day, or even multi-day training sessions. Many manufacturing employees Training that cannot be tied to a desired outcome is unlikely to have much impact. WAYNE S. CHANESKI | COLUMNIST Making your training efforts work best for you.